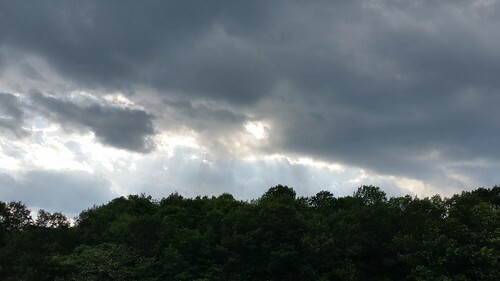 Darker clouds with rays of sun slipping through to shine one a wooded area. There are some shots I can't resist, no matter how bad they come out. This isn't too bad, but I probably needed a better soom. However, if I used the zoom, I don't think I would strike the contrast of deep gree with dark gray that also is present within this photo. But generally speaking, I can't resist taking photos of rays of sun slipping through a sprawl of clouds. I'm pretty sure this isn't my first one in this series where I've tried to do it. But there's just something cool in witnessing it (or even feeling the sun come down upon you when otherwise the sky is filled with clouds. And in this case, with those dark gray clouds, the contrast of a bright yellow shining through is a zen-filled moment.